It’s Like Having Your Own Sous Chef! With SliceOMatic in your arsenal of kitchen tools, you will feel like you have your own sous chef to help you with the tedious job of chopping, dicing and prepping. The amazing kitchen slicer comes with both a julienne and chopping blade so that no matter what you need, you can get it in just seconds, and the handy catch container keeps your food contained for easy transfer to the dish you are creating. 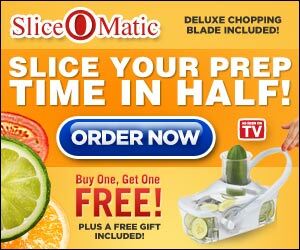 SliceOMatic Let’s You Slice with Ease! The Slice-O-Matic features an easy-glide handle and a dial that easily adjusts to let you change the thickness of the slices. 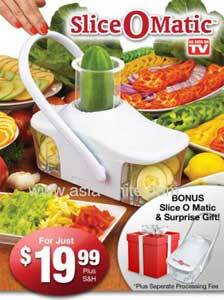 So whether you are slicing or dicing potatoes, onions or carrots, you will have uniform pieces in just seconds. And if you are one of those people who cries a river each time you slice an onion, you will love the fact that the SliceOMatic’s handy catch container keeps the fumes contained and keeps your eyes dry! When you order today, you will get 2 Slice-O-Matics for just $19.99 plus shipping and handling.